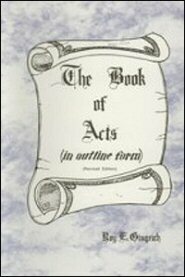 The Book of Acts is one of the New Testament’s most important books. It links the ministry of Christ in the Gospels with the teachings of the Apostles in the Epistles and it gives us the background for the Pauline Epistles. It, the first chapter of church history, records the spread of the gospel, during a short thirty-three years’ period, from Jerusalem, the capital city of the Jewish world, to Rome, the capital city of the Gentile world. The book reveals to us Spirit-inspired missionary methods and practices which our present-day churches could study and follow with profit. Our Christian knowledge would be greatly impaired if we did not have The Book of Acts. This commentary, though concise in form, is complete and thorough in its coverage. This unique ability of the author to be brief yet thorough has made his books to be in demand in ever-widening circles. His commentaries, in outline form, are especially helpful to students who have small libraries, to pastors who have a busy schedule and to Sunday School teachers and laymen who are pressed in finding time for Bible study.